On the first day of the year 1996, the “Great Merger” officially happened. This brought the fleets and all assets of William Lines Inc. (WLI), Carlos A. Gothong Lines Inc. (CAGLI) and Aboitiz Shipping Corporation (ASC) under one single company and management except for some very old ferries of Aboitiz Shipping Corporation (the likes of Legazpi) and a some ferries and container ships of Aboitiz Jebsens (that was a separate company) which were the container ships acquired from the Ukraine. This was supposedly a preemptive move so local shipping can compete against the purported entry of foreign competition in the inter-island routes which proved to be a bogey or a false story later. How some old shipping families believed that foreigners can enter with a Anti-Cabotage Law in effect that forbids foreign shipping firms from sailing in local routes is beyond me because repeal of any law passes through Congress and our Congress is usually not keen on passing laws that grants free passage to foreigners and if those three liner and container shipping companies are willing, the regional shipping companies and other companies might not be willing and they can also raise a ruckus. But anyway the unlikely merger happened and a very big shipping company was formed from previously competitors. Any merger usually results in excess assets and in shipping that includes ships aside from management personnel and employees and logistical assets like containers, container yards and buildings. This was easily obvious with the WG&A merger. Since there were excess liners some of it were sent to its regional subsidiary Cebu Ferries Corporation (CFC) like when the Mabuhay 6 (the Our Lady of Good Voyage) and the Our Lady of Lipa were sent there. Meanwhile, all the cruisers liners were offered for sale. They also tried to dispose old and unreliable ROROs like the Dona Cristina, Don Calvino and the Dona Lili that were formerly regional ferries. Actually even some recent liners were also offered for sale. The total was about 10 and that was already about a third of the combined fleet. That also included a handful of container ships. I knew it early there was a conflict with the disposal of ships when I had as a cabin mate in SuperFerry 7 the cargo manager of William Lines in North Harbor and he was furious because to him it seems that the liners of William Lines were being targeted. Well, that might have been the unintended result of getting Aboitiz Jebsens as fleet and maintenance manager because they will use their old standard in choosing ships (that company was subsequently renamed to WG&A Jebsens to reflect the changed circumstances). One has to look into recent history to understand this. Aboitiz Shipping Corporation as a liner company did not acquire any liners from 1974 to 1988 and the one they acquired in 1988 was inconsequential as it was just the small and old cruiser liner Katipunan of Escano Lines which became the Legaspi 1. By that time Aboitiz Shipping Corporation had just a few old liners sailing, a combination of former “FS” ships which were on its last legs and a few old cruisers including the pair acquired from Everett Steamship, the Legazpi and the Elcano which were also clearly obsolete already and getting unreliable. It looked to me that without their partner Jebsens Maritime that was influential in their container shipping (which was actually good), they might not have had their blockbuster SuperFerry series. If one looks at the SuperFerry series of Aboitiz Shipping Corporation, one will easily see its distinguishing characteristics. They are all ROROs (or more exactly ROPAXes) with car ramps at the bow and at the stern, the container vans are all mounted in trailers, trailer caddies hauled them in a fast manner and if possible the two car ramps are both employed so one is dedicated for loading and the other for unloading. Radios are also employed for communication to orchestrate the movement of the container vans so a trailer caddy hauling a container aboard will have a container being unloaded on the way down and markers are used so loading of container vans will not be helter-skelter which can mean difficulty in unloading a container van in an intermediate port. To remedy their serious lack of liners due to non-purchase in the recent years past, Aboitiz Shipping Corporation and Aboitiz Jebsens designed their liners to have short interport hours as in 2 to 3 hours only, the former the preferred time. In Manila and in the endport, the port hours were also very short. With this kind of operation the SuperFerries had a high number of hours at sea on a weekly basis which meant maximum utilization. While a Sulpicio Lines liner will only have a round-trip voyage if the route is Southern Mindanao, an Aboitiz ship will still have a short trip to the likes of Panay within the same week or else do a twice a week Northern Mindanao voyage. With this style, their 4 SuperFerry ships were in practicality the equal of 5 or 6 ships of the competition. Of course with this kind of use of ships a heavy load of preventive maintenance is needed and that happened to be the forte of Aboitiz Jebsens. When the Chiongbian and Gothong families agreed to the Aboitiz proposal to have Aboitiz Jebsens as fleet and maintenance manager they should have already known was in store and that is the liners should perform the Aboitiz Jebsens way and that meant those which can’t will fall into disfavor and might be the target for culling because with the Aboitiz Jebsens system a lesser number of liners will be needed to maintain their route system and frequencies. Of course at the start WG & A will try to employ all the liners that were not relegated to their subsidiary Cebu Ferries Corporation. But then new liners were still coming onstream, the liners William Lines, Gothong Lines and Aboitiz Shipping ordered when they were still separate companies. WG & A created new routes and frequencies but in a short time they realized what cannot be maintained because there are not enough passengers or cargo like the routes to Tacloban and Dipolog (Dapitan actually) and the Manila-Dumaguete-Cotabato and Manila-Cebu-Surigao-Davao routes. With that “weak” and “inefficient” ships will be targets for culling aside from the old liners and there was no question that cruiser liners will be first in the firing line. That type cannot carry much cargo and their cargo handling in the interport is longer as cargo booms are not as fast in loading and unloading unlike trailer caddies. So it was no surprise that the cruiser liners Misamis Occidental, Tacloban City and Iligan City, formerly of William Lines were almost immediately up for sale. The small ROPAX Zamboanga City was also offered for sale because her engines were big relative to her size and capacity (16,800-horsepower engines) and she had no ramps at the bow. That also went true for the slow Maynilad (14-15 knots only on 16,800 horsepower). The problem with these is they were all former William Lines ship, the reason why some former William Lines people were upset. But they accepted Aboitiz Jebsens as the fleet manager and so that will almost inevitably be the result. Some lesser liners survived. The “Our Lady” ships of Gothong Lines survived because for their size and capacity their engines were small and that speaks of efficiency and though while a little slower they were fit for the short routes like the northern Panay routes (Dumaguit and Roxas City) or in the periphery like Masbate and Eastern Visayas. The northern Panay route also became the refuge of the Our Lady of Naju, a former Gothong ship which was also a cruiser. The passengers and cargo of the route were not big and so a big cruiser liner like the Dona Virginia will not fit. But of course all that favored the former Gothong ships. It might just have been a quirk of fate and not necessarily because the Gothong representative to the WG & A Board of Directors who is Bob Gothong is close to the Aboitizes. But then I wonder how the Our Lady of Lipa survived. For her size she has big engines and speed was not really needed in the Dumaguit/Roxas City route. Was it because they wanted to show up their competitor the old but beautiful cruiser liner Don Julio of Negros Navigation? 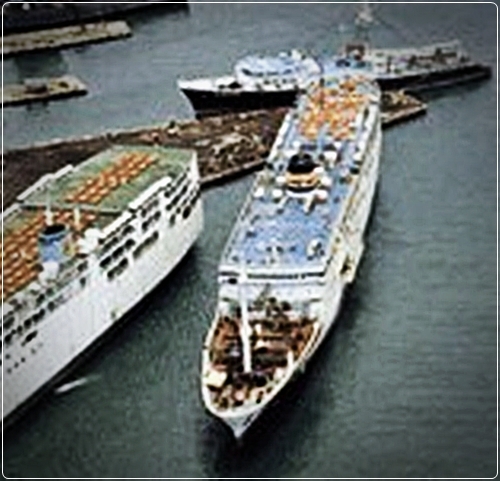 I thought when the old cruiser liner Misamis Occidental was refurbished to become the cruiser ship Our Lady of Montserrat, a former William Lines vessel she might have fitted the route (she was even re-engined and became all-airconditioned like the Our Lady of Naju). Was her speed not really enough for the route? Or WG & A wants a ship that is really superior to the competition? It was not surprising then that in the early merger years that former William Lines officers and employees would think it was only their vessels which was on the firing line or chopping block. The beautiful SuperFerry 11 which was fielded after the merger was also not that favored. Her engines are just about okay for her size, she has the speed but then like the Zamboanga City she has no car ramps at the bow because she also came from A” Lines of Japan. She was also destined for William Lines if the merger did not happen. The beautiful Maynilad would have easily been a SuperFerry in terms of size and accommodations if not for her grave lack of speed. Being excess later the SuperFerry 11 and Maynilad were passed to Cebu Ferries Corporation and they were the biggest ships that company ever had. That was after WG & A created an entirely new route for them, the Manila-Ormoc-Nasipit route which in first report was good. But then along the years WG & A and successor company Aboitiz Transport System (ATS) developed a reputation for being very soft in holding and maintaining routes. In Cebu Ferries the SuperFerry 11 was renamed to Our Lady of Banneux and the Maynilad was renamed to Our Lady of Akita 2 after her top passenger deck was removed. The two happened to be ex-William Lines ships also! Although not clearly disfavored (as she made the SuperFerry grade), the Our Lady of Banneux which can run at up to 19 knots had a grounding incident in Canigao Channel from which she never recovered again. So actually the William liners were the great casualties of the merger due to redundancy and incompatibility and that was because they were unlike the original SuperFerry liners and they simply cannot make the SuperFerry grade (well, just like the former “Our Lady” ships of Gothong Lines only one of those made the SuperFerry grade, the former Our Lady of Akita which became the SuperFerry 6). Of course their former Mabuhay 1 and Mabuhay 3 which made the SuperFerry grade lived longer. The former Mabuhay 2 was not lucky as she was hit by fire early which led to complete total loss. In the longer run only the Mabuhay 1 and Mabuhay 3 survived and the Mabuhay 3 as SuperFerry 8 was even leased to Papua New Guinea because of the surplus of liners in WG & A. The liners of Carlos A. Gothong Lines Inc. (CAGLI) were more lucky as they found niche routes and small engines played into their favor. Moreover many of the former Gothong Lines ships were in regional routes and they lived long there including their former small liners the Our Lady of Fatima and the Our Lady of Lourdes which were sister ships. That even included the venerable Our Lady of the Rule and their old Our Lady of Guadalupe which has unreliable engines and I even wonder how she lasted so long. In the regional routes some former ships of William Lines survived like the Our Lady of Good Voyage and the Our Lady of Manaoag. When the Chiongbian family of William Lines divested in 2003 only 2 of their former liners remained in WG & A aside from a few container ships. They were paid off in cash from the passenger and container ships that were scrapped. There were still many Gothong ships in the fleet of WG & A when they divested as most survived the culling but they preferred newly-acquired ships when they restarted independent operations. And that was the story of the ship design conflict in WG & A which have been one of the reasons why the “Great Merger” unraveled so soon.